As good as those donuts, chocolate bars and other desserts look, you’ll want to resist if you suffer from joint pain. Processed sugars trigger the release of inflammatory messengers known as cytokines. This includes sugar in candy, sodas and cereals and other snacks. Excess sugar in the body also puts pressure on the joints and can lead to weight gain. Monosodium glutamate or MSG is a flavor-enhancing additive that is most commonly found in soy sauce and Asian foods. But it can also be found in fast food meals, prepared soups and soup mixes, salad dressings and deli meats. MSG can trigger inflammation in the body and worsen joint pain. Alcohol isn’t just hard on your liver. Excessive alcohol consumption also has a negative effect on joint pain. Beer contains purines. These are converted into uric acid in the body, which is extremely detrimental to joint pain. Beer also contains gluten, which can be harmful to fragile joints. White flour products such as breads and crackers, white rice, white potatoes and many cereals are refined carbohydrates. Studies have shown that processed carbs may be one of the main causes of obesity and other chronic conditions. These foods have a high glycemic index. They fuel the production of AGE, which stimulates inflammation. Both red and processed meats contain purine and nitrate. These chemicals aggravate pain and inflammation in the body. Studies have shown that red and processed meats not only trigger inflammation, they also support cancer growth. For most people, dairy is a highly inflammatory food. Studies have shown that the majority of adults have at least some difficulty digesting milk, whether they know it or not. Making dairy a large part of your diet can trigger an inflammatory response. 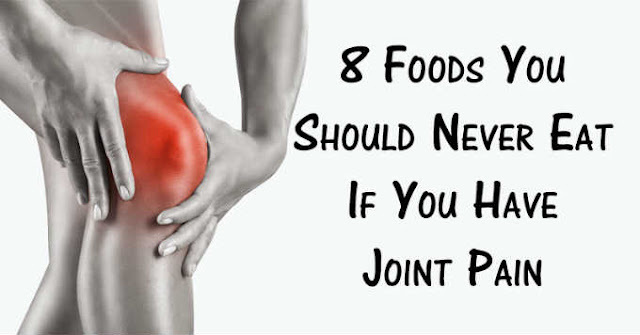 If you suffer from joint pain, it’s best to keep dairy products out of your diet. Many packaged and pre-made foods contain excessive amounts of salt and other preservatives in order to promote longer shelf lives. Refined salt is high in additives and chemicals that disrupt the fluid balance in the body. Pay attention to what’s in your food. Avoid junk food and microwaveable meals. If you want to use salt when cooking, replace your table salt with Pink Himalayan sea salt. Many snacks and baked goods contain corn oil or other oils that are high in omega-6 fatty acids. Studies have shown that these oils can lead to inflammation. Avoid soy, peanuts, salad dressings and grape seed oil. Replace foods containing omega-6 fatty acids with anti-inflammatory omega-3 alternatives such as olive oil, nuts, pumpkin seeds and flax seeds.